CCA Kids Blog: Share our CharityBuzz Auction! In just 5 hours, several items in our Charitybuzz auction end. 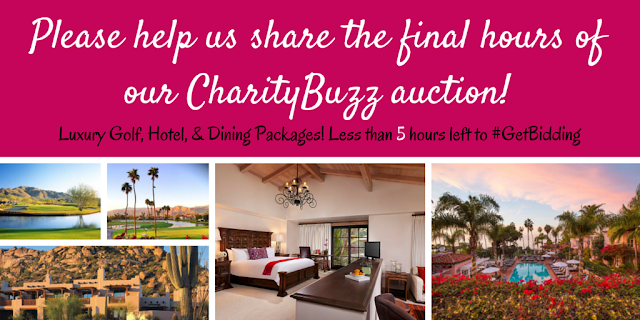 Please share this post to encourage everyone you know to ‪#‎GetBidding‬ on our luxury golf, hotel, and dining packages. 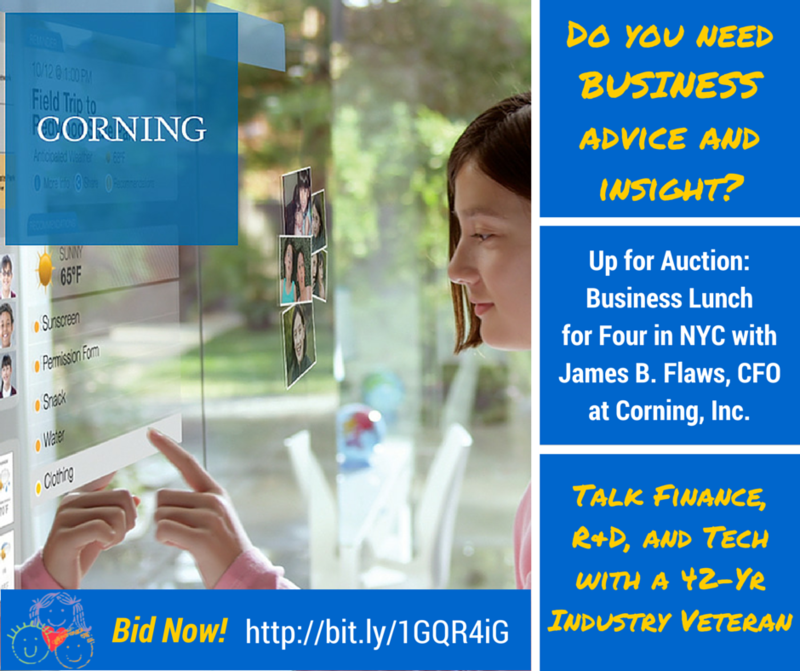 Another great lot up for bid is a NYC luncheon with the CFO of Corning, Inc., James B. Flaws. You and three guests will enjoy lunch in New York City with James B. Flaws. James B. Flaws has served as Corning’s chief financial officer since 1997 and vice chairman since 2002. Flaws is responsible for all financial functions at Corning Incorporated (NYSE:GLW), a Fortune 500 company that is one of the world’s leading innovators in materials science. Corning is a 163-year-old company known for life-changing innovations dating back to producing the glass envelope for Thomas Edison’s light bulb. Corning also provided breakthrough products like the television tube (1939), CorningWare (1957), low-loss optical fiber (1970), liquid crystal display glass (1985), and Gorilla Glass (2007). Corning succeeds through sustained investment in R&D, a unique combination of material and process innovation, and close collaboration with customers to solve tough technology challenges. Corning’s businesses and markets are constantly evolving. Today, Corning’s products enable diverse industries such as consumer electronics, telecommunications, transportation, and life sciences. Flaws is the chief steward of Corning’s financial health and under his leadership Corning has maintained a strong balance sheet with cash and generated cash flow. Flaws joined Corning Incorporated (then known as Corning Glass Works) in 1973 and early in his career, he held a variety of positions within Corning's Consumer Products group, including chief financial officer. CCA sincerely appreciates all the donors who graciously gave these packages for us to auction. We'd love it if you could share this link on your social media profiles today to encourage bidding ... because the more we raise, the more kids we sent to retreat and the more families we help afford quality medical care for our cranio warriors. Albuquerque Friends - Get Some Froyo!